Over the past several days, cyberbullies have targeted me in reprehensible fashion. What they don’t realize is that I’m not the type of person who will just sit back and take their abuse. I say accurately because pickles are, in fact, an abomination to human sensibility. We needn’t rehash all the definitive statements why. Reality is reality, and this is a statement of reality. In any event, my social media accounts have lit up with numerous links to a story out of western Pennsylvania and Ohio that would turn the stomach of any well-adjusted human being. I don’t expect much respectability coming from a region that cheated its way to victory in an online cheesesteak poll. Nor do I know Grandpa Joe personally. That is where I come in. I don’t care if a “huge response” has Grandpa Joe needing “10-15 business days” to process online orders for this liquid travesty. If numbers lent validity to all things, we’d have to consider Donald Trump’s presidency a valid one, and that it is not. Yeah, yeah, some of you will say let the market decide whether people will spend $9.99 for a bottle of bubbly, cane-sugar hell via online order (and $2.50 in person). Well, allow me to retort: The market only decided to take a look at Ford Pintos when they started exploding after rear-end collisions. This is no different. I’ll break it down like this: Pickles represent a culinary atomic bomb while pickle-juice soda is a dirty bomb. If Grandpa Joe’s had a Philadelphia location, I would waltz in that front door, buy its entire stock and smash each and every last bottle on the sidewalk out front. If it meant spending 36 to 72 hours in the Roundhouse lockup, so be it. It’d be a sacrifice worth making for the betterment of humanity. Besides, I would be the hero of the holding cell. 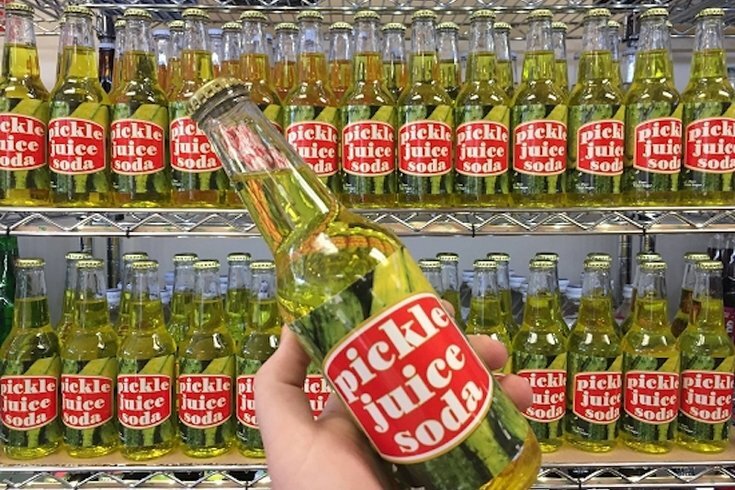 Offering pickle-juice soda is no better than selling candy cigarettes with Joe Camel tribute artists on the packaging to children. We’re better than this, people. Let’s start acting like it. Oh yeah, stop sending me that link already. With all due respect, I don’t care if the travesty caught Pee Wee Herman’s fancy. When products like this surface, even Pee Wee can’t save civilization as we know it from spiraling counter-clockwise down the proverbial life toilet.